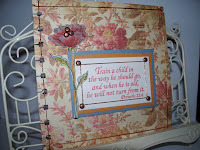 This is my March submission for the Divine Design Bible Verse Challenge on splitcoaststampers. This page was inspired by Scott and Ramah Troutman, and their love and caring for their students. Many times, our Sunday School conversation involves discussion about how it seems that many of today's children lack the experience of having a "Church Family", and enjoying the love, support, and security that comes along with that particular experience. Today's children are missing out on an crucial resource that will help them to deal with the difficulties that life hands their way, each and every day. During the upcoming Holy Week, I pray for those children who are aching for love and guidance to find what they are looking for through the love of Christ our Lord. Happy Easter, and God's blessings to you and yours, today and always!